Talk Counselling & Coaching Aren’t Enough to Motivate Change. Why? Translation: Many, many therapies have been created to motivate and change behavior. Talk counselling is just one of them. Taken alone, talk counselling and/or coaching may not be enough. Changing conscious programs or conditioning is important but not the only goal. Simply put, our subconscious programming is responsible for 95 percent of our personality and our behaviour. Using conscious modalities of therapy only touches the 5 percent of beliefs. It does not touch or transform the 95 percent of the subconscious programming from genetics and from childhood developmental programming from the environment. What is subconscious programming? It’s like an operating system on a computer. Our subconscious mind contains our habits, memories, beliefs, and control over your body. Therefore, it requires specific modalities to address this operating system. A multifaceted approach to your emotional well-being would include some aspect of talk counselling and coaching. But what else can you bring to the table? Think of it as brain training! Hypnotherapy is a method designed to help patients create new reactions, behaviors, thoughts, and feelings. Nothing like the “you are getting sleepy” jokes in pop culture, these techniques have decades of research to prove them safe and effective. As with neurofeedback, hypnotherapy is used to treat a very wide range of issues and conditions. Furthermore, through the power of suggestion, hypnotherapy can decrease your anxiety and increase our mindfulness. An experienced hypnotherapist will help you reshape your emotional landscape. We are often doing negative self-hypnosis on our self every time we think a negative thought or potential outcome. Why not learn how to transform this into positive self-hypnosis for healthy outcomes! Athletes, business people, and students use hypnotherapy to do just that and set healthy goals and enhance their performance. Although technically a form of “talk counselling,” cognitive behavior therapy or CBT does not focus on root causes and childhood issues. Thus, the focus is on solutions and this begins with creating a better understanding of perception vs. reality. It’s unrealistic to expect yourself to grasp all the subtle nuances and variations in the realm of therapy. Therefore, if you’re desperately seeking the motivation to change your behavior, initially you need a guide to point you in the best direction. 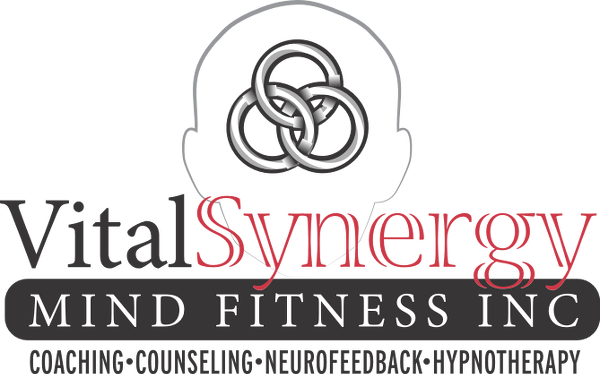 At Vital Synergy Mind Fitness, Inc., we provide a wide range of multidisciplinary options. For over 36 years, we’ve offered a safe, comfortable, and caring environment to effectively resolve a wide range of issues that are preventing the enjoyment of a full, happy and successful life.